Phoebe's craters are named after the Argonauts, explorers of Greek mythology who sought the golden fleece. Twenty-four of the largest craterson Phoebe, the small, retrograde outer moon of Saturn have been assigned namesby the International Astronomical Union. Two image montages of Phoebe, takenin June 2004 on Cassini's first stop on its tour ofSaturn, have been released and show the names and locations of the 24 cratersidentified by the Cassini imaging team as prominentenough to receive names. The International Astronomical Union,the international authority for assigning names to planetary surface features, makesuse of different naming categories for surface features on each object. Thatway, when people hear or see a name, they can associate it with the object onwhich the feature is found. The IAU often start with names associated with thelegends involving the being whose name is given to the object itself, thenchoose an additional category if more names are needed. This is what happened with Phoebe, aTitan goddess and Apollo's grandmother in Greek mythology. Since her legend is rather short, there werenot enough names for all the features that required them. 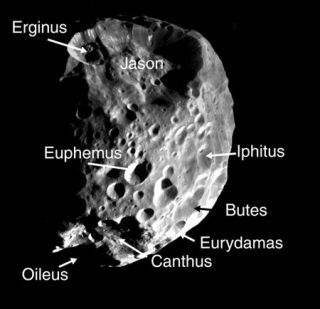 "We picked the legend of theArgonauts for Phoebe as it has some resonance with the exploration of theSaturn system by Cassini-Huygens," said TobyOwen, of the University of Hawaii at Manoa. He is the chairman of the International AstronomicalUnion Outer Solar System Task Group and an interdisciplinary scientist on the Cassini-Huygens mission. "We can't say that ourparticipating scientists include heroes like Hercules and Atalanta,but they do represent a wide, international spectrum of outstanding people whowere willing to take the risk of joining this voyage to a distant realm inhopes of bringing back a grand prize," said Owen. "Considering the length andcomplexity of the Cassini mission, it is appropriatethat the names of these courageous voyagers from one of our favorite myths havebeen used for the first Cassini maps of the Saturnsystem," said Peter Thomas, Cassini imaging teammember, Cornell University, Ithaca, N.Y. and one of the imaging scientists whoidentified the craters requiring names and created the image montages. Phoebe is an icy, ancient remnant ofthe small bodies that formed over four billion years ago in the outer reachesof the solar system. It must have been captured by giant Saturn in the planet'searliest, formative years. Images collected during Cassini's close flyby of Phoebe have yielded strongevidence that the tiny object may contain ice-rich material overlain with athin layer of darker material perhaps 300 to 500 meters (980 to 1,600 feet)thick. The surface of Phoebe is also heavily potholed with large and smallcraters. Images reveal bright streaks in the ramparts of the largest craters,bright rays which emanate from smaller craters and uninterrupted grooves acrossthe face of the body. Phoebe's craters are thought to be the result ofcollisions with smaller objects. "Since the dawn of exploration,humans have made maps to document where they have been and how to get there," saidTorrence Johnson, Cassiniimaging team member at NASA's Jet Propulsion Laboratory, Pasadena, Calif., whocoordinated the naming of the Phoebe craters with the IAU. "Having names for the places on the map is anessential part of this process. With the assignment of names to craters on itssurface, Phoebe now joins the ranks of charted worlds."